Information: George Butterworth, author of books about English folk dance. The Country Dance Book, vol. III. Sharp, Cecil J., and Butterworth, George. London: Novello, 1912, 1927. 35 dances from Playford's English Dancing Master 1650-1728.Issued with Country Dance Tunes #5 and #6. The Country Dance Book, vol. IV. Sharp, Cecil J., and Butterworth, George. London: Novello; New York: Gray, 1916. 43 dances from Playford's English Dancing Master 1650-1728. The Country Dance Book, vol. VI. Sharp, Cecil J., and Butterworth, George. London: Novello; New York: Gray, 1919. 52 dances from Playford's English Dancing Master 1650-1728. The Morris Book. Sharp, Cecil J., Macilwaine, H.C., and Butterworth, George. London: Novello, 1906. History and instructions for Morris dances. 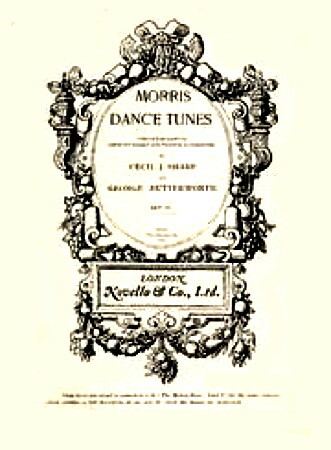 The Morris Book, vols. 1-5. Sharp, Cecil J., Macilwaine, H.C., and Butterworth, George. London: Novello, 1909-1913. History and instructions for Morris dances.